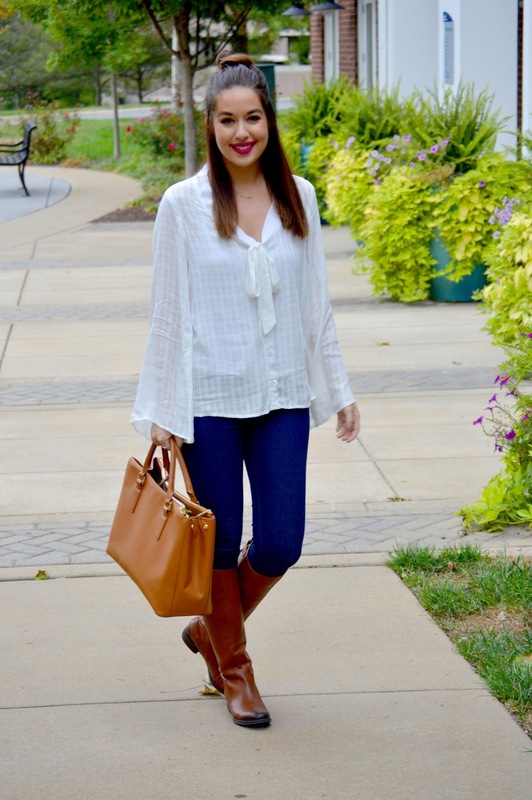 Blouse: Wayf, Jeans: Topshop "Joni," Bag: Tory Burch, Shoes: Sam Edelman (on sale! ), Lip Color: Colourpop "I Heart This"
Happy Hump Day everyone! Today I'm featuring this GORGEOUS blouse from Wayf. I absolutely love the bell sleeves and the 70's feel of this top. I feel sort of like Austin Powers in this top (in a good way of course lol!) This blouse would look adorable under a faux fur vest or with a pencil skirt if you get more dressed up for work! Also, I posted last week about how I purchased a pair of Vince Camuto riding boots that just didn't work out. I didn't really like how dark they were and they were a little too narrow/stiff. I returned them and got these Sam Edelman "Penny" boots which are actually on sale right now. I LOVE them! They're the exact color I was hoping for and the quality is amazing. The leather is super soft and not nearly as rigid as the other boots. If you're in the market for a good pair of every day riding boots, I highly recommend these! 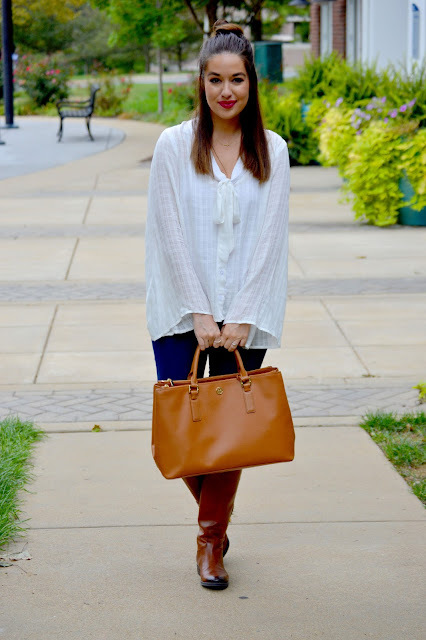 Linking up with Mix & Match Fashion! Ahh, that blouse is so pretty, and you wear it so well! Hello Gorgeous!! This blouse is amazing Kelly, I love the way you styled it, it looks so fun feminine and adorable! You look so beautiful, Kelly! I adore this outfit and the 70s vibe it exudes, very trendy! That bag is gorgeous and so are those riding boots! I'm so glad you were able to find a better pair, you go girl! Hoping you have an amazing day! Wow you look gorgeous, lovely outfit hun, the bag is amazing ah!! I love this look, matching boots and purses are so chic during fall! love it! you look fab! This is such a pretty look! I love the Sam Edelman boots! Have a great day! Loving this fun flowy top and those boots are gorgeous! This blouse is amazing! I love the retro vibe. Also your hair is super cute and those boots are so classy! your blouse is so gorgeous!! Love the bag and the boots! The classic colors all work so well together! Looooove 70s style right now- this is a great look, and digging the boots! You look fabulous! Killing this look!